This is another obscure Japanese camera company whose history is shrouded in mystery. It is known that Dai-ichi Optical developed a Leica copy, the Ichicon-35 in 1954. That same year they sold off the design to a company known as Mejiro Optical. The Ichicon-35 was a very well designed and well made camera. It's not really known why Dai-ichi discontinued the Ichicon-35, but they went on to produce a number of folding cameras and twin lens reflexes. The Ichicon-35 is not marked as to who made it, although I would assume it was made by Dai-ichi, and few were produced. 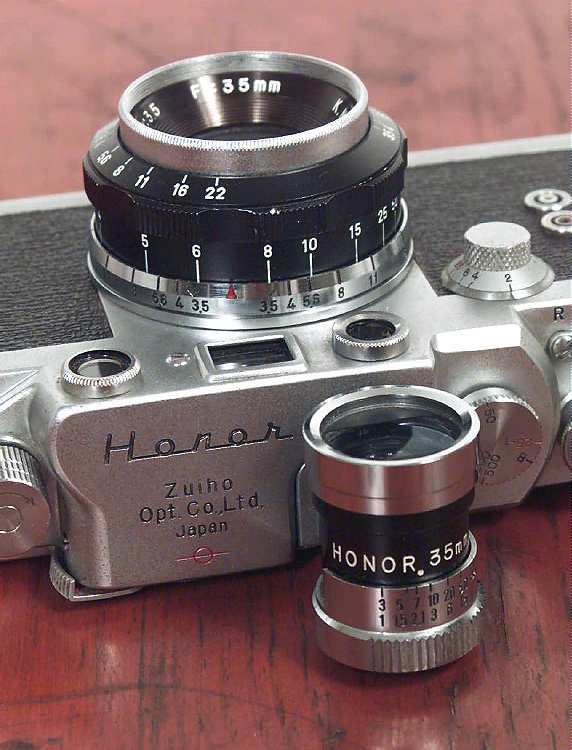 The Honor camera was first introduced in 1956 with the company name engraved on the top plate as Honor Opt. Literature from the period list the manufacturer as Mejiro until about 1958, when it becomes Zuiho. Why the cameras are marked Honor Opt instead of Mejiro? Maybe we will never know.